Thanks for the inspiration which we know at this stage of maturity but always need to be refreshed and growing in our walk. Pray you and Steve are enjoying retirement and your family. Which I am sure you are. God is good and there is always joy in serving sometimes more so in retirement. Yep, refreshment is always welcome in my heart, too! And yes, we’re enjoying very much being close to family, babysitting Elena Mon-Fri, exploring what Cincinnati has to offer, etc. Not sure I feel “retired” yet. Just what IS it supposed to feel like?! How about that! Isn’t it fun when our thoughts run along the same track? Blessings to you! wow love being inspired and educated. didn’t know about the portion concept. That adds lots of meaning to that verse. Thank you, Jean. I love discovering new concepts in God’s Word, too! Thanks for these words, Nancy. Very inspiring. I’ve been going through some very rough things the last year or so. I took a huge leap of faith and quit my job a little over a year ago, and it’s been rough going ever since. I made that decision very prayerfully and thought for sure that God would provide something not longer after I left my last job, but I’ve been dealing with unemployment and financial hardships for more than a year now and every time I apply for a job, I get the door slammed in my face. It’s hard to trust that God is my provider when the doors keep closing, but this is a great reminder that he is my portion and provider no matter what. Thanks! Jessica, my heart aches for you as you face uncertainty and rejection–both such painful experiences. I pray God SOON provides a job and in retrospect, you will be able to see that his provision, his timing was best after all. Do let me know how events unfold. I will continue to pray! Thank you so much for your prayers and encouragement! I will definitely let you know how things turn out. 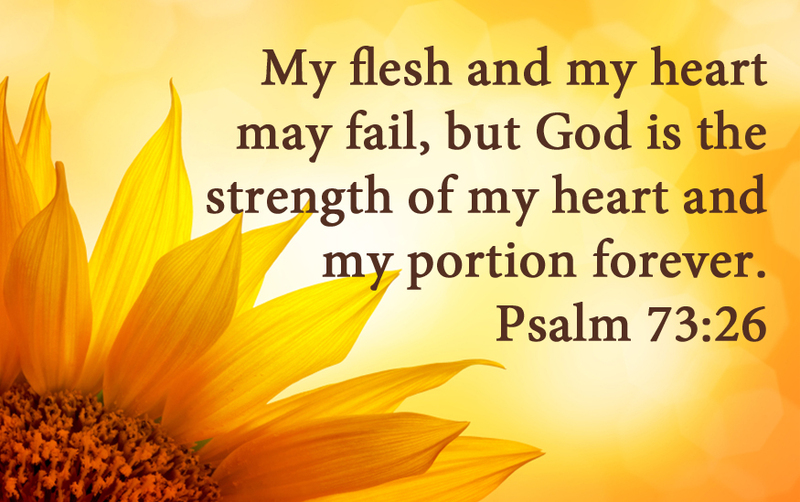 A blessing is that God’s portion is there for us daily, not just now and then but every day. Thanks Nancy for the reminder. God bless you. Oh, yes! Praise God for his constancy! And thank you, Laura, for your added insight. I had always just skipped over that phrase ‘He is our portion forever’ without giving it much thought other than He is there for me. Through your research you have given new depth and meaning to ‘portion’. I love the way ALL of God’s children receive ALL of Him. Thank you for this. No one else but God can give 100% of Himself to 100% of His people. This is especially meaningful to me as a mathematics major, as mere mortals must divide their efforts and time among many people and situations. We multitask our way through life, dividing our time and energy almost by rote. God is ALWAYS doing what man presumes is impossible! How I love Him for this! So glad you found the post meaningful, Cheri. “All of us have all of Him.” It IS rather mind-boggling, isn’t it? Thank you for your thoughtful comments.